It is a new year and school is starting back up for starving students everywhere. I’m sure during your winter break you took plenty of pictures of family, friends and perhaps some tropical locales you were lucky enough to visit. Now that you have all these lovely pictures I bet you are thinking about all the cool ways you can display them, right? You could spend your time printing pictures out and arranging them in a neat collage like you did back in middle school or you could head over to Photovisi and make a collage there. 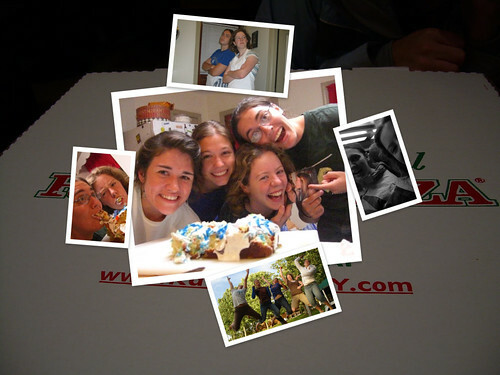 Ok, so maybe I am not the most creative person in the world (yes that is a pizza box as the background) but, I am sure someone like you could make a collage much better than mine in no time at all. So go ahead and make that collage of you and your friends making fools of yourselves or maybe a secret collage of your celebrity crush. Also, if you happen to make a collage worth putting on everyday items you have the option personalize various products with your collage. Didn’t you always want a mug with your mug on it? So try it out and let us know how it goes. If anything, the best part about online collages is not having to worry about getting glue all over the place or maybe that is just a personal issue…anyway happy collaging!